– Picton councillors decided to ask the town’s voters if daylight savings time should be continued. Councillors had received a fair amount of criticism for instituting the practice that summer. The time change was adopted to keep Picton in line with other municipalities. – A set of 28 new ornamental light standards arrived in Picton. The lights would be installed onto pre-poured concrete bases and wired underground. It was anticipated the new system would be completed and running by the end of October. – The federal Progressive Conservatives elected Ontario premier George Drew as their new leader. Despite winning a majority provincially, Drew had lost his own High Park seat in the June provincial election and turned his focus to Ottawa. – The Bloomfield Silver Ribbons won the Ontario Baseball Association’s eastern Intermediate C title over Napanee in a three-game series. The Silver Ribbons would wait to face the western champions for the provincial championship. 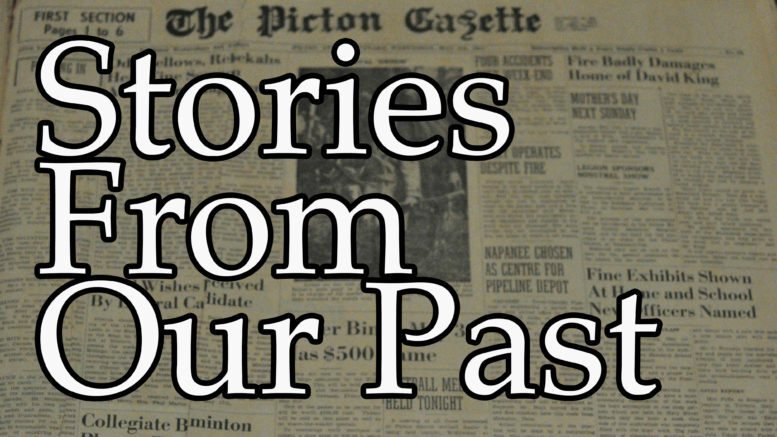 – Some 400 former members of the famed Hastings and Prince Edward Regiment met at the Bridge Street Armories in Belleville for the company’s fourth annual reunion and reminisced on their service. – Despite its signage, Picton solicitor Jack Ward determined Store Street was never adopted by the town. Instead, he found the street, which ran to Picton Bay, was an extension of Head Street. The town would change maps and signage to reflect the accurate name of the road. – Picton IGA owner Gary Gardiner announced plans for a shopping mall to complement the expanded store he was building to compete with A&P. He was hoping to attract a second anchor store and a number of smaller tenants for the project. – Judge Robert Walmsley, of Picton, was appointed associate chief judge for the province’s family court division after a decade on the bench in the Quinte region. – The OPP executed a drug bust on Miller Road, netting in excess of 7,300 grams of processed marijuana, viable plants, and cannabis resin oil, valued at over $150,000. The occupants of the home faced criminal charges for possession for the purposes of trafficking and unlawful production. – A 31-year-old Rossmore man interrupted a theft in progress at his home and twice fended off assaults from the three intruders who returned armed with a knife. The man used a baseball bat to fend off the men until police could arrive and make arrests. – Prince Edward County Memorial Hospital administrator Monty Boultbee called it a “horrendous task” to amalgamate four Quinte hospitals by an Oct. 31 deadline.